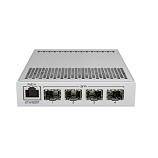 The CRS305 is a compact yet very powerful switch, featuring four SFP+ ports, for up to 10 Gbit per port. The device has a 1 Gbit copper ethernet port for management access and two DC jacks for power redundancy. The device is a very sleek and compact metallic case without any fans, for silent operation. The device has a “Dual boot” feature that allows you to choose between two operating systems - RouterOS or SwOS. If you prefer to have a simplified operating system with only switch specific features, use SwOS. If you would like the ability to use routing and other Layer 3 features in your CRS, use RouterOS. You can select the desired operating system from RouterOS, from SwOS or from the RouterBOOT loader settings. All the feature set comes with a disruptive price, providing the best price/performance on the market.